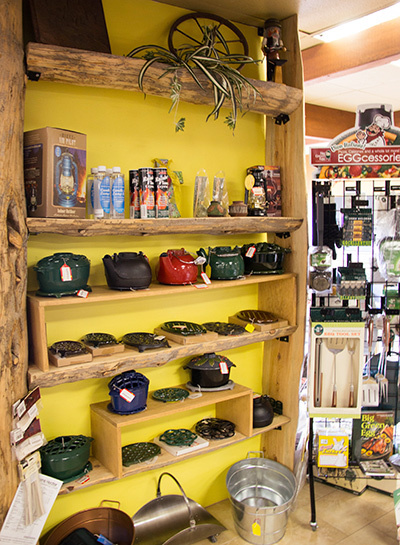 Stop by our Jackson CA hearth store & showroom to view a wide selection of fireplace & hearth accessories. We serve residents in Jackson, Ione, San Andreas, Wilseyville, Fiddletown, Martell, Angels Camp, Mokelumne Hill, West Point and all of Amador & Calaveras counties. We offer our customers more than just access to the best fireplaces, top rated inserts, and efficient heating stoves. 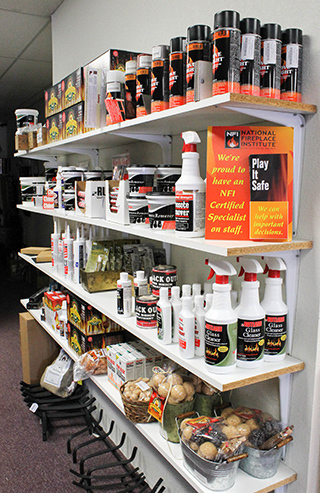 We also have a fully stocked showroom of fun & functional hearth accessories, including tool sets, fireplace screens & doors, mantel shelves, hearth pads & rugs, and many other accessories that will help you get the most enjoyment out of your hearth or heating appliance. From fireplace accessories to fun gifts, you can find a range of items that will complete the look of your fireplace or stove and provide a number of conveniences that can help you maintain, manage, clean, and enjoy your hearth. Visit our showroom & store in Jackson CA to view our selection of practical and visually appealing fireplace & hearth accessories. 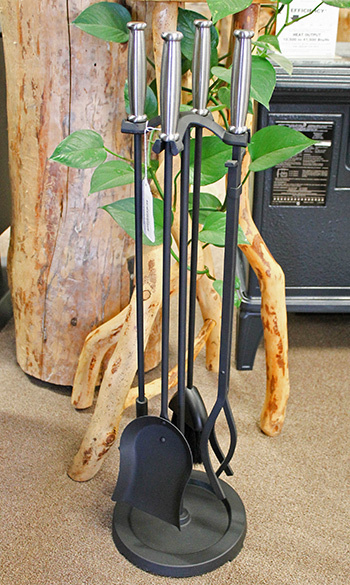 Fireplace tool sets that include tongs, a broom, a poker, and a shovel are a must-have accessory for any fireplace or stove. These helpful tools help you to maintain a wood fire safely and with style. Choose from nickle, brass, copper, or a range of other finishes to perfectly complement your current design & decor. We also offer hand forged, custom made sets for a unique finishing touch. Fireplace glass doors are an excellent addition to gas or wood fireplaces. Not only do they provide an enclosure for the opening of your fireplace, they also add a level of safety and efficiency that open burning fireplaces don't have. Properly installed glass doors help increase the heat efficiency and output of your fireplace which can help reduce utility bills in the winter, and will keep cool air in the summer from escaping out of the chimney which is great for many homeowners here in CA! Plus, they provide a safety barrier between a live fire and the surroundings. Glass doors are available in ceramic glass or tempered glass and can be custom fit for your fireplace opening. If you want to install a heating stove, such as a wood or pellet unit, local building codes may require you to have adequate floor protection. Hearth pads & stove boards are an attractive way to get the floor protection you need without needing to install a raised hearth or platform. 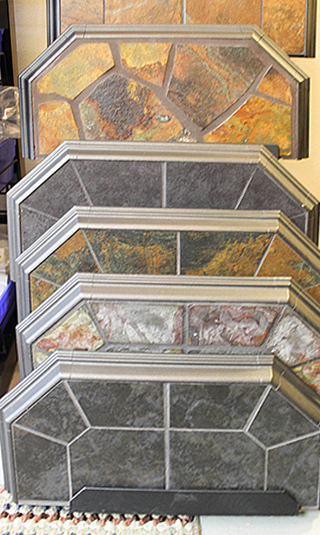 Hearth pads are available in a range of colors, styles, and sizes and can mimic the look of tile, stone, or pavers. The options are seemingly endless when it comes to color combinations and shapes, so stop by our showroom to see what we offer. Fireplace screens are a decorative accessory that you can place in front of your fireplace to prevent sparks or floating embers from escaping out of the fireplace and potentially causing burns or fires. They are as functional as they are beautiful and can provide you with an extra level of safety to keep your furry friends or little children out of a live fire. We have great selection of fireplace screens that come in a range of finishes and styles, such as traditional, rustic, contemporary, or classic. A simple mantel shelf can add a stunning detail to your boring or bland fireplace. These shelves are easy to install and can display decor, pictures, or your favorite collector pieces. If you want to add a little pizzazz to your fireplace but don't want the expense of an entire surround or floor-to-ceiling wall treatment, a mantel shelf if a very cost-friendly choice. 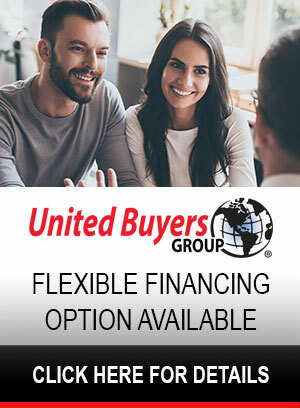 You can also find fireplace starters, log racks, hearth rugs, fireplace grates, kettles, fans, ash buckets, grills, cleaners, and more at our fully stocked showroom. 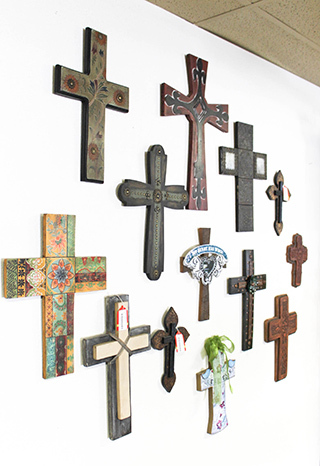 From fun home decor gifts to functional tools, the list goes on and on. 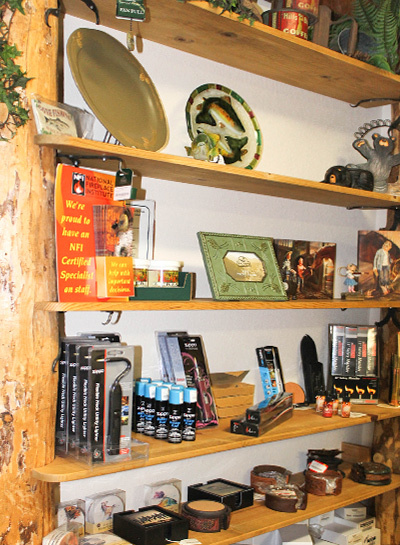 Come by and browse our selection of miscellaneous gifts and accessories today.